I was trading at Sterkshof festival in June and spent some lovely drinking time with a bunch of Danish guys snappily called 'The Yellow Bastards' (thanks guys - it was fun). 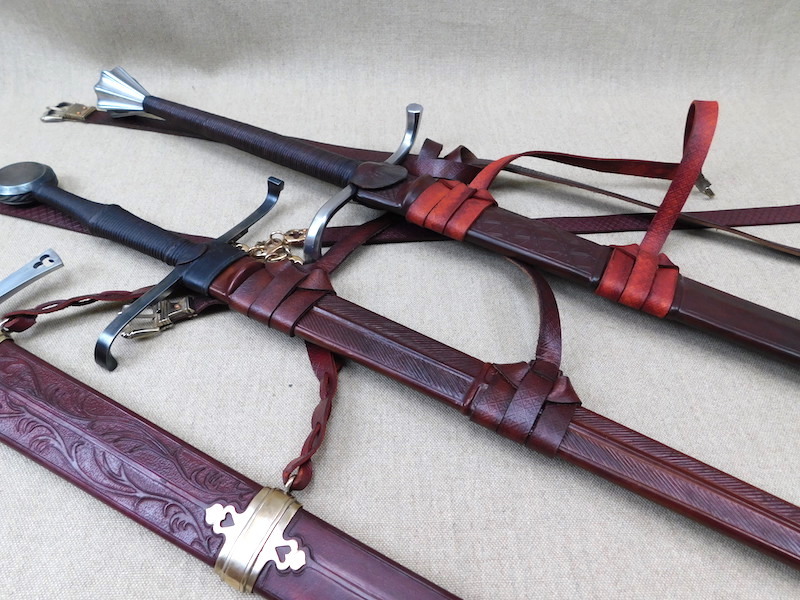 Whilst with them I handed over the scabbard shown here http://myArmoury.com/talk/viewtopic.php?t=36682 and collected an Albion Cluny and a Svante to make scabbards for. 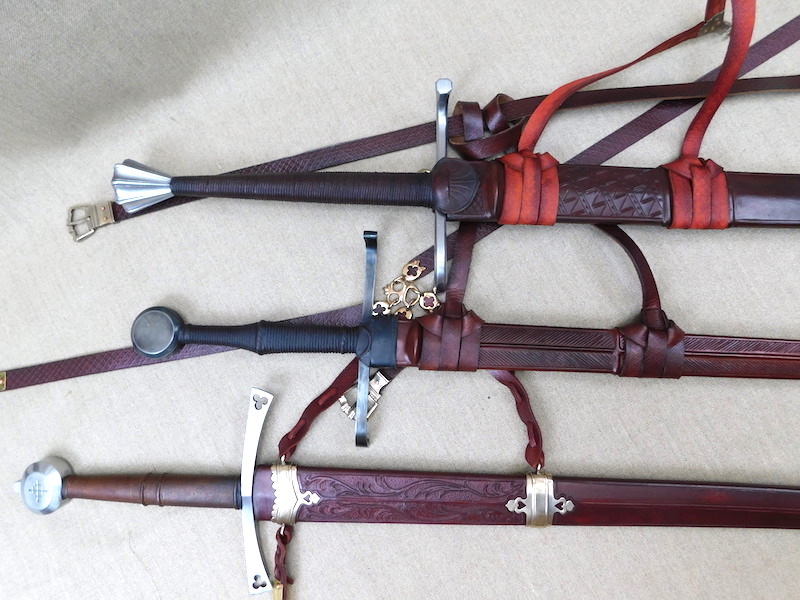 These are both very very different swords and both very, very nice, so it was a pleasure to be able to scabbard them both. At around the same time I had a commission for a scabbard for an Albion Landgraf heading off to Canada, so I had a bit of a session. 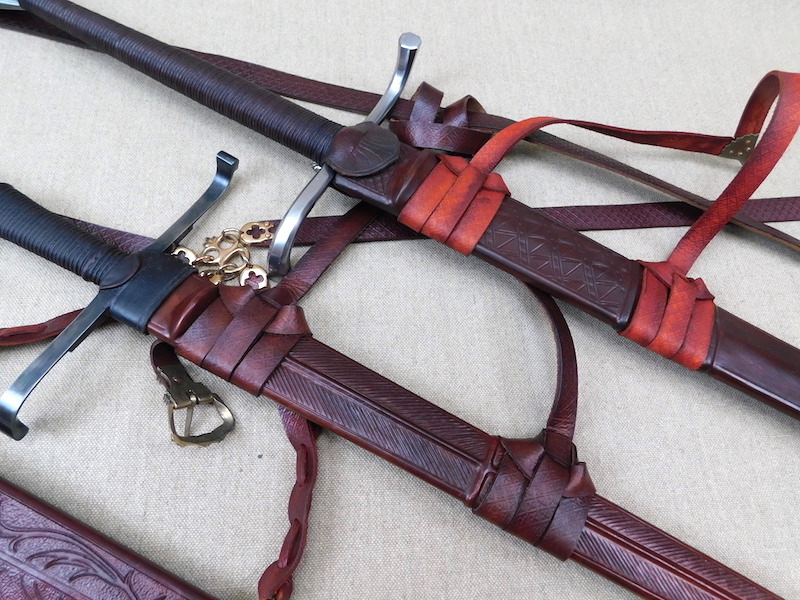 The Svante is very broad and quite massive, but in fact not that long, especially for a two hander, so we decided to scabbard this as a standard hand and a half and so there is a poplar core, covered in veg tan leather with a little incised decoration lashed straps. This was the format I thought it should have, but not wanting to deface Peters' work, I dropped PJ a line and he generously confirmed I was on the right track and so here you are. As a complete contrast, the Cluny is thinner than a human hair, and we based the scabbard on a few wood cuts of the period. These are characterised by a long chape, a central ridge and diagonal slashed/incised decoration running down the length of the scabbard. The suspension is not entirely clear in these pictures, but it was decided to simply turn the suspension strap around the belt. 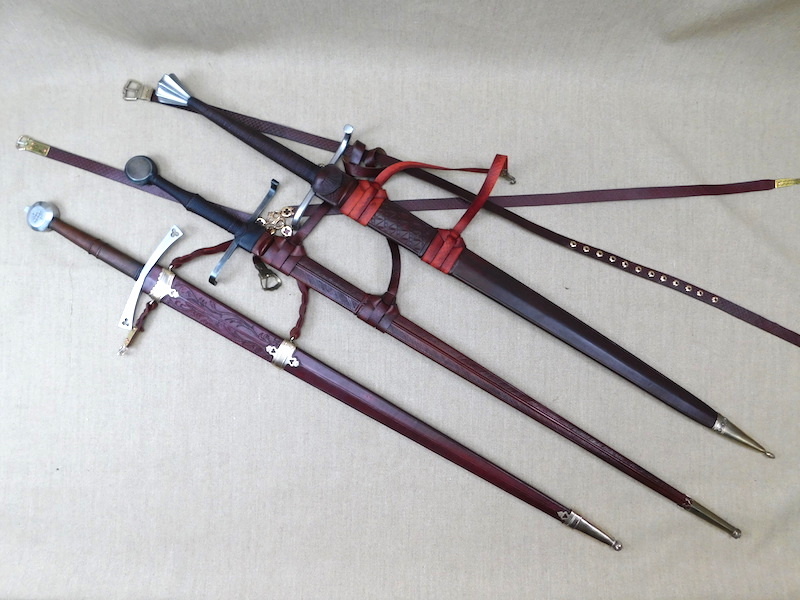 A simple but elegant scabbard, that is set off by the prominent top riser. Attention had to be paid to make the core and leather thin enough for the rain guard/chappe of the sword to slide over the top of the scabbard. 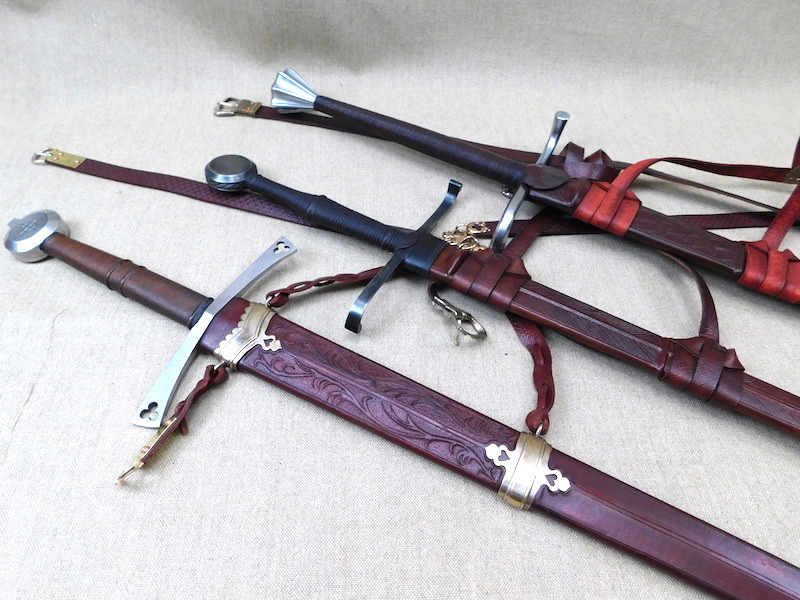 The Landgraf is a lovely sword, but for some reason, not one I make scabbards for very often (if at all). This required bronze fittings connected to the belt with laced straps and a floral motif to the leather carving which covers the top section. Hell of a set there! These are some of my favorites. Perfect lines. To see them all together in one group shot is especially brilliant. Really love the tooling you've been doing lately, especially a fan of the work on the Svante. 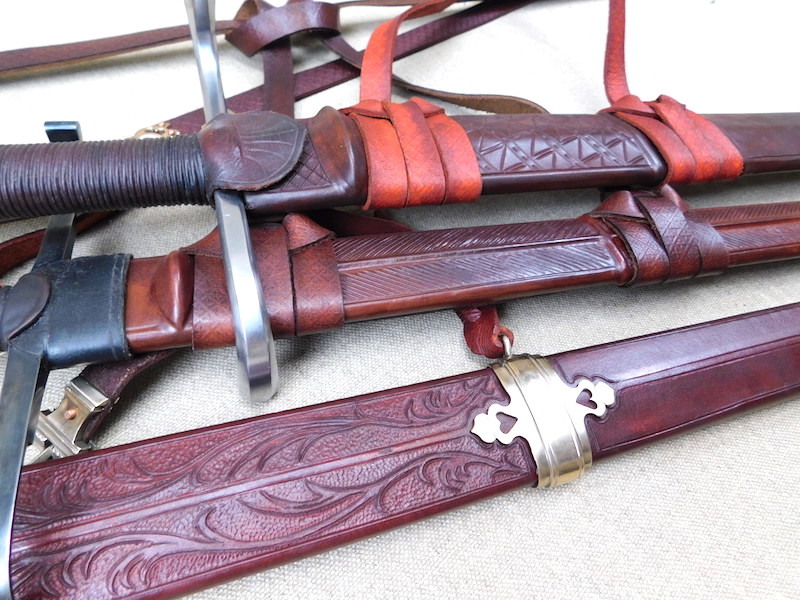 Probably be hitting you up myself for another scabbard or two before the end of the year, I somehow find myself more excited to get your scabbards than the swords themselves. No favorites Leo, each one is brilliant. Well done!